Thacher Island and its Twin Lights are dimly visible through the fog in this postcard. The view over Loblolly Cove is from somewhere above Eden Road near where it intersects with Penzance Road. On several older maps of the area, Loblolly Cove was called Lamorna Cove and Eden Road was called Tintagel Road. 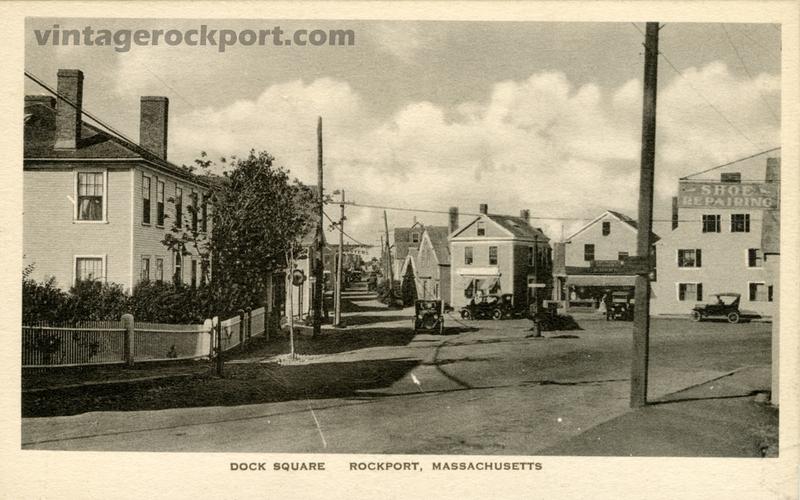 The postcard is from the Rockport Photo Bureau. It was never used or postmarked. 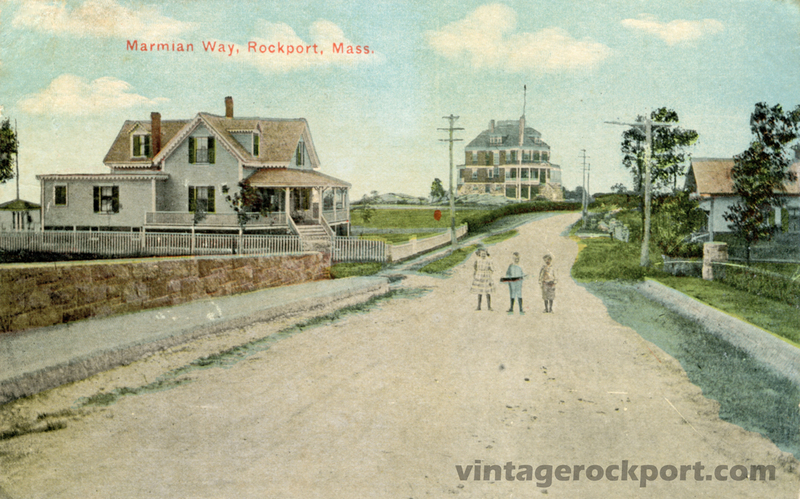 By comparing the printing on the reverse to other postcards from the Rockport Photo Bureau, I estimate it to have been published around 1920. Here is a classic view of the sun setting over Rockport harbor, as seen from the Headlands. This postcard was postmarked on Aug. 19, 1912, but the picture has to be earlier than that because of what it shows. Note the smokestack in the center left of the picture. That is from the old Annisquam Cotton Mill, which once filled the area along Broadway between School Street and Main Street. It was destroyed by fire in 1882, but the ruins remained there for another 22 years, until they were finally removed in 1904. Given that the smokestack was removed in 1904, the picture is from then or earlier. Annisquam Cotton Mill, Before and After the 1882 Fire. Old Mill Ruins, Rockport, Mass., circa 1904. There is a pole with a sign in the center of the square where today there is an island. In this view from just a couple years later, that pole appears to be gone. In this much earlier view, there was a large tree at that point, just as there is today. Dock Square, Rockport, Mass., circa 1908. Dock Square, The Old Pool House and Entrance to Bearskin Neck, circa 1930. 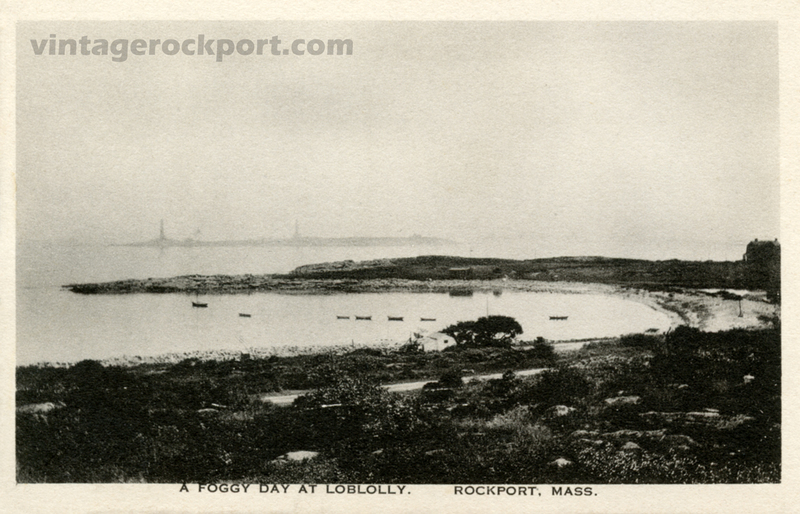 This postcard was published by the Rockport Photo Bureau. It is not dated. Judging by the appearance of the reverse side and by the cars visible in the picture, I estimate it to be from around 1928. 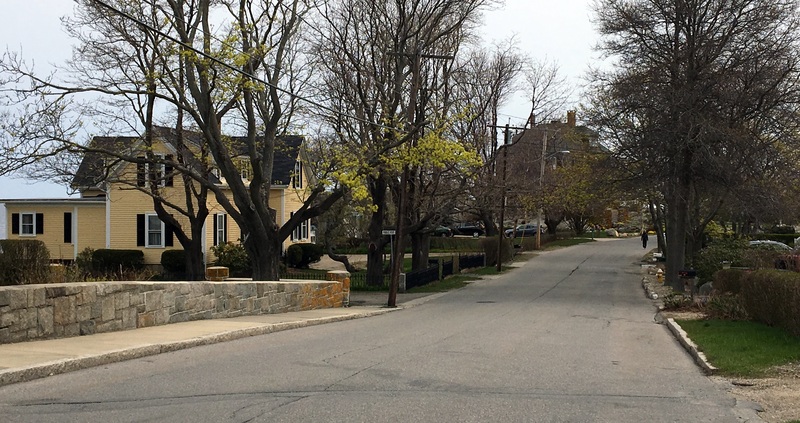 On the site where formerly stood this inn, the town of Rockport is now building a park. This should be welcome news to Rockporters and visitors alike, because the views from here are spectacular. Over the years, various attempts were made to rebuild on the property. In 1978, The Sandpiper’s owner, John Krenn, obtained a zoning variance to construct a two-story, 2o-room inn, but the variance lapsed when construction did not begin. In the 1980s, a subsequent owner was granted a variance to build a four-unit condominium on the site. A court later revoked the variance, ruling that the town should not have granted it. The Beaches Inn (a/k/a Cape Hedge Inn), Rockport, Mass., circa 1965. 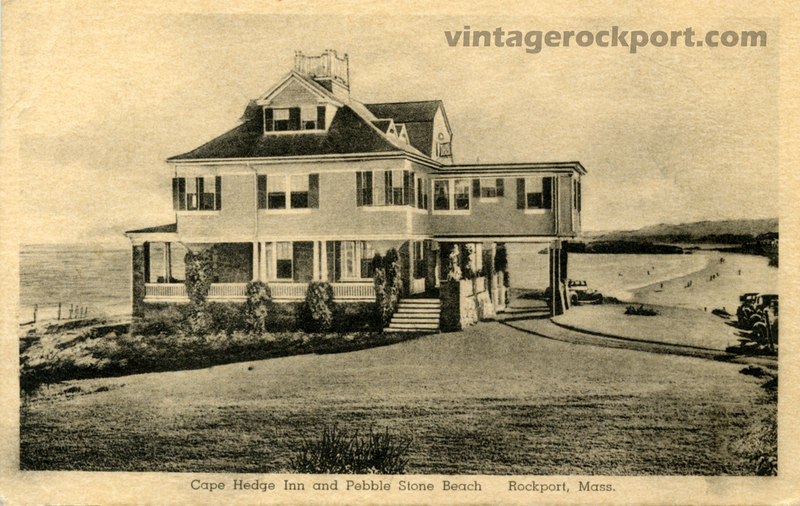 The Original Cape Hedge Inn and Annex, Rockport, Mass., 1953. 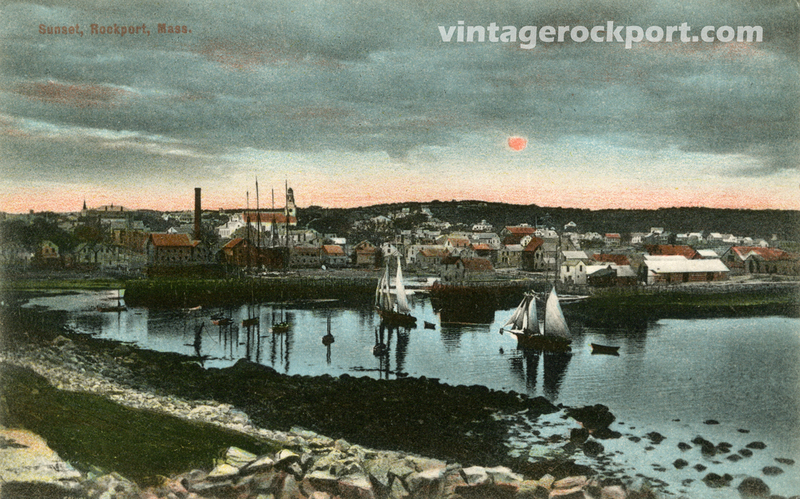 This postcard was published by the Rockport Photo Bureau. There is no date on the reverse side. Based on the similarity of the printing on the reverse side to other cards I have, and judging by what can be seen of the cars in the picture, I estimate this to be around 1939. Note the misspelling of Marmion Way as Marmian Way in this postcard’s caption. Even so, this is a wonderful old view, made better by the three children posing in the middle of the road. All of the houses you see here are still standing today, as is the stone wall on the left. At the end of that wall, just about where the children are standing, is the entrance today to the Old Garden Path. I have another postcard that shows two of the same houses pictured above, but from the vantage point of the Old Garden Path. I have another postcard from around the same time showing the view looking in the opposite direction, taken just on the other side of the house on the left above. You can see the same house in that other postcard. The house on the left was known in the 1960s and 1970s as the Hammock House. Its owner, Paul Dow, began making hammocks in his retirement for family and friends. As demand grew for his hammocks, he started selling them from his home. This postcard does not identify a publisher. It was postmarked in 1911. This is a real-photo postcard showing a house with a woman and her dog standing at the gate. The house is not identified anywhere on the postcard. 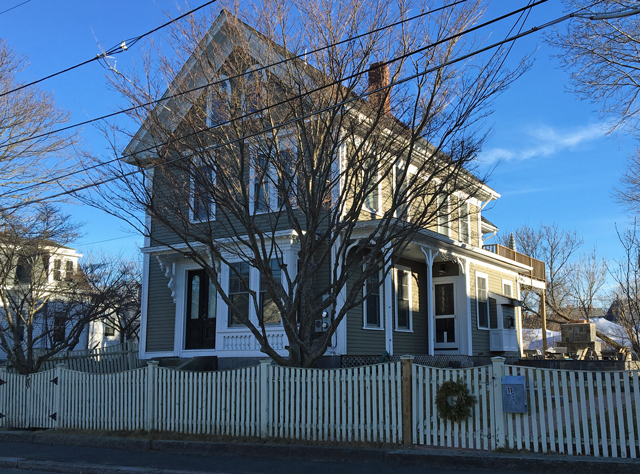 However, I have identified it as the house that still stands at 11 Broadway Avenue in Rockport. The card was mailed in 1911. There is a long note on the reverse side but it is illegible. The same house as it looks today. An 1884 street atlas of Rockport identifies this property as then belonging to “Levi Gott Heirs.” As far as I can determine, there was only one Levi Gott who ever lived in Rockport in the 1800s. He was a descendant of Samuel Gott, one of Rockport’s first settlers. He married Martha Tarr, a descendant of Richard Tarr, Rockport’s first settler. Levi died in 1876, which would comport with the 1884 atlas listing referring to his heirs. Interestingly, the fathers of both Levi and Martha — John Gott and Jabez Tarr — fought at the battle of Bunker Hill. Levi and Martha had two children: John S. Gott, born Dec. 2, 1843, and Susan Tarr Gott, born May 25, 1837. John died in 1928 and is buried at Beech Grove Cemetary. 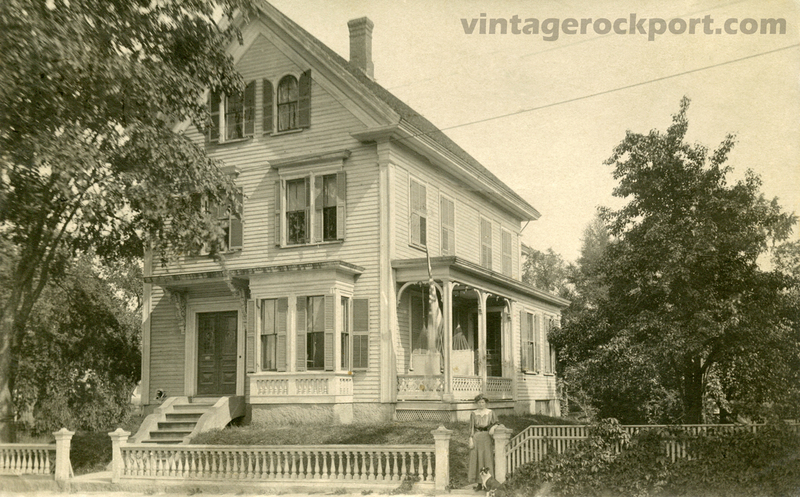 A later 1899 atlas does not identify the owner of this property, but it shows the house next door as belonging to “J.S. Gott.” It may be, then, that Levi left this property and the one next to it to his children — or at least to John. The back side shows that the card was mailed on Jan. 9, 2011. This real-photo postcard shows the view from Paradise Cliff along Eden Road in Rockport. In the distance is Thacher Island and its twin lighthouses, while a schooner passes between the island and the shore. 1903 ad for lots at Paradise Cliff.